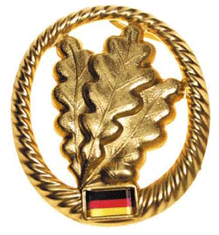 The West German unit portrayed at East Wind is a Jaeger (light infantry) unit. The Bundeswehr did not station large combat formations in West Berlin. The Jaegers are some of the more plausible units to be deployed, or otherwise find their way into Berlin at a time of crisis. As a Jaeger, you'll be fighting as light infantry. This means long range patrols, distant patrol bases and operations on the border. You will frequently operate as a small unit, without direct combat support. The Jaegers have no organic (assigned to them) motor transport assets. Expect to spend more time on your feet, and carrying a pack, than the other NATO forces. Of course, when applicable transport or support is available, it will be provided. You will enjoy the benefits of high quality personal equipment at very affordable prices. West German personal equipment is lighter and easier to handle than that of most other NATO member nations. Each individual attending as a West German Bundeswehr soldat is required to have all of the equipment listed on this page before they will be allowed entry to the field. Click on the name of each item for more details, and photos. There will be an inspection when you sign in. If you have questions, or are having trouble sourcing some items, please contact us. While some of the equipment on the list may not seem to have immediate value, it is not just for the sake of realism or re-enacting. All the equipment is designed to work as a system, with other people's gear, and with the heavy equipment we provide. For example, it seems like any cup, bowl or plate would work for eating off. But using the correct mess kit means the serving line runs faster, and your kit fits into the cleaning equipment we provide. G3 or G36 (full length) airsoft weapon system. Low or mid cap magazines for your weapon. At least two complete uniforms in Flectarn pattern. At least four pairs of socks. German helmet with flectarn cover. Quality full-leather or Gore-Tex boots. Flectarn Gore-Tex or Sympatex rain parka. German issue compass, carried on load bearing gear at all times. An entrenching tool, a mattock, a machete, or a hatchet. Minimum of two dead rags. Pad of paper and a pencil. Wool blanket or poncho liner.